Over at Lotus Renault GP, Bruno Senna replaces Nick Heidfeld. The Brazilian last raced at the 2010 Abu Dhabi Grand Prix, where he drove for Hispania Racing. Renault has made no secret of their disappointment with Heidfeld, despite his acceptable position in the driver standings – ahead of Vitaly Petrov. Heidfeld finished on the podium in the Malaysian Grand Prix, but a recent run of unsatisfactory results have left him out of a seat, possibly spelling the end of his Formula One career. Senna will look to make his mark at Renault, who are eager to promote Romain Grosjean once he seals the GP2 title, which could be as early as this weekend. In the long term, one of Grosjean or Senna could find themselves at a full time seat next year should Robert Kubica not be able to return to racing. Alternatively, an impressive performance could attract the eyes of rival teams. Senna didn’t grab the attention in 2010, but with a midfield car, now is the time for him to exceed. He has to take this chance with both hands. The last three races have shown that Ferrari and McLaren has closed the gap to Red Bull. An air of dominance no longer surrounds reigning champion Sebastian Vettel as he has failed to win since the European Grand Prix in June. Despite that, the title is in his hands as he has an 85 point lead with 200 remaining and many suspect that he’ll leave Suzuka in October as a double world champion. Nevertheless, McLaren and Ferrari will be intent on winning the remaining eight events to prove that they will be back with a bang in 2012. McLaren won here last year, whilst Ferrari has focused on improving their aerodynamic efficiency, which was vindicated by Fernando Alonso’s win at Silverstone. Alonso will be hoping for a good result on a track that has not necessarily delivered him strong results in the past. 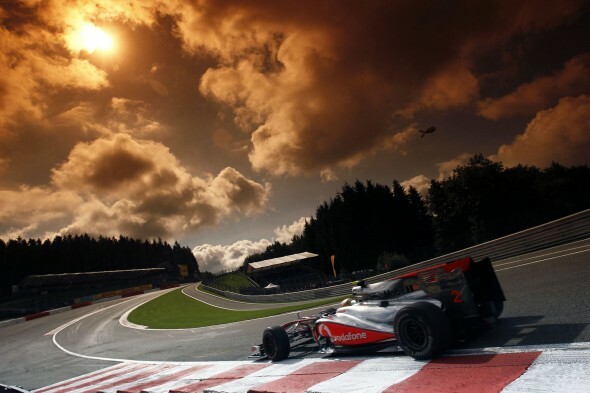 Astonishingly, only Michael Schumacher, Lewis Hamilton and Felipe Massa (debatable) have actually won the Belgian Grand Prix out of the 24 men starting the race. Schumacher hits the big 2-0. The 1991 Belgian Grand Prix is significant for the fact that it marked Michael Schumacher’s debut in Formula One. In the space of a weekend, Schumacher had gone from a relative unknown in the paddock to a young hotshot. He qualified 7th and although his clutch broke on Lap 1, he made his mark and was quickly signed by Benetton. The rest, they say, is history. Schumacher will mark his 20th anniversary with a special cap and numerous celebratory events. On a track where he has excelled in the past, perhaps the Schumi magic could return one last time on Sunday. As ever, the weather will be unpredictable as showers come from nowhere in the Ardennes forest. Initial forecasts indicate that Friday will be affected by wet weather and that the rest of the weekend will carry a reduced risk of wet running. Don’t be surprised though if a shower hits the track at any point in the weekend. The DRS zone will be at Kemmel and will be 700 metres long. During free practice and qualifying, the use of DRS will be banned through the Eau Rouge complex due to safety concerns. Sadly. There's also home interest in the form of Virgin Racing's Jerome d'Ambrosio. Belgian citizens haven't been able to cheer on one of their own in over 15 years and his presence should boost much needed ticket sales.